Smith Heating & Cooling is proud to serve the Harrisburg community! About Harrisburg, MO - Happy to be your hometown Heating & Air Conditioning Contractor! 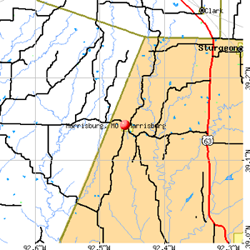 Harrisburg is a small village located in Boone County, MO, and according to the 2010 census, the population was 266. This population was up from 187 in 2000. The village is a part of the Columbia, Missouri Metropolitan Statistical Area, and the Harrisburg R-VIII School District operates a high school, elementary school, and middle school. Harrisburg and the rest of northeastern Missouri have a climate the changes dramatically depending on the season, and it falls between humid subtropical and humid continental climate types. Because of the small size of Harrisburg, most of its attractions are found in nearby Columbia. Columbia is home to the Missouri Theatre Center for the Arts and the Jesse Auditorium. Museum enthusiasts may enjoy the Museum of Art and Archaeology, while nature lovers will likely appreciate a trip to Rock Bridge Memorial State Park. Ragtag Cinema and The Blue Note are other popular destinations.